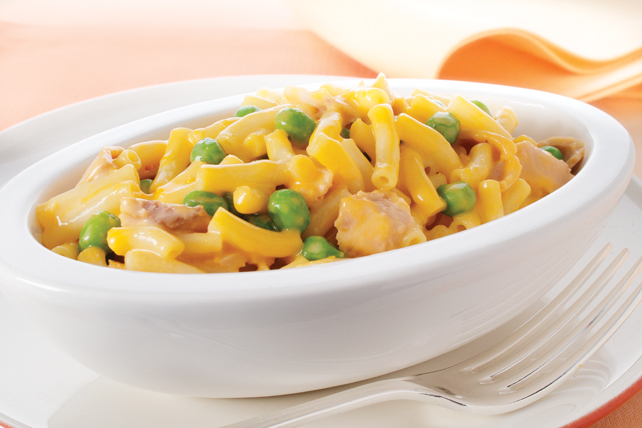 One pot + three ingredients + 20 minutes = an easy, cheesy tuna noodle dish dotted with bright green peas. Sold you yet? Prepare Kraft Dinner in large saucepan as directed on package, adding peas to the boiling water for the last 3 min. Stir in tuna; cook on low heat 1 to 2 min. or until heated through, stirring occasionally. Stir 1/2 cup Cracker Barrel Shredded Old Cheddar Cheese into Kraft Dinner mixture along with the tuna. Substitute your favourite frozen vegetable, such as corn, broccoli or green beans, for the peas.